The T-28 is one of those aircraft that has a pretty big following and many were hoping for a decent new tool kit to replace the ancient Monogram version. Now that wait is over as Roden has produced the first of what will surely be several versions of the T-28. 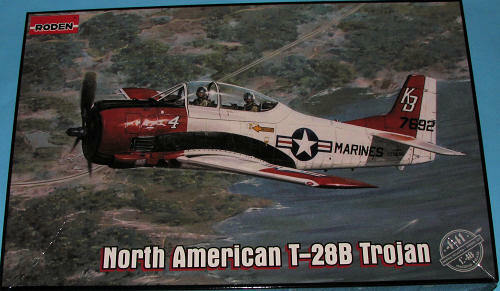 They chose the T-28B which is the land based version and the one most frequently seen in warbird colors. These aircraft remained as trainers with the USN well into the 1970 and with other nations even longer than that. The 1820 engine is well done with a wiring harness. The cockpit has separate rudder pedals, control sticks, instrument panels and seats. Armor plating for the seats is on the sprue but not used in the trainer version. The control sticks are especially frail as, despite gentle sawing with the finest blade, I broke both of them at exactly the same place when removing them from the sprue. You have decals for the instrument panel or you can use separate aftermarket instruments as the bezels are molded on the panels. The proper high pressure wheels/tires for a Navy version are supplied along with the correct nose wheel. Both the flaps and the ailerons are separate items. It was normal for the flaps to be down when the aircraft was on the ground. I also noticed that the little actuating rods for the three cowl flaps were part of the kit. The speed brake can also be posed down. This was handy for maintenance as the UHF radio was in the open speedbrake well. Gear wells are nicely done though, like the speedbrake well, they are fictitious and basic. The gear is nicely detailed and the nose gear is quite scale, which means it may be easily broken. This is especially true once sufficient nose weight is installed, as a great deal will be needed. Finally, the canopy sections are separate with the glass separate from the frame for the rear piece. Instructions are well done with references for four major paint lines. All the colors needed during build are clearly shown. There are markings for three planes. First is an airc raft assigned to the 'parachute group' at NAF El Centro in overall white. Next is the box art plane is from Kaneohe Bay and in the standard International Orange and White colors. The last is in the very early yellow scheme while assiced to the Pacific Fleet All Weather Training Squadron in 1970. Decals are superbly printed and very glossy. Roden decals do not have a good reputation for stick so many will be hoping for an aftermarket sheet or two for this plane. 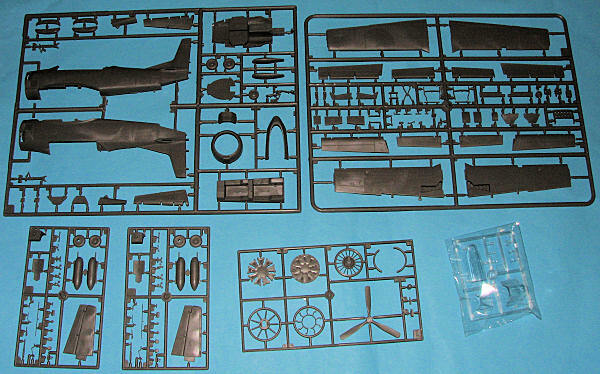 I know that many of you (and I) are pleased that a new mold T-28 has been released. I anticipate many of these being sold and I know I will be building this one so stay tuned.